Only less than five days before we leave, and I have a few baskets of laundry to wash, clean the house — yes, I am one of those crazy ones who obsess about coming back to a tidy place — write two articles, cook and style three recipes, write them down, finish my last-minute Christmas shopping (thank God for online shopping too), find my ski gloves and socks, make a batch of chocolate truffles to bring along to France, bake biscotti because we ate every piece I made last week, send a present to a friend, pay a few bills, work on some of my writing projects, and make sure that I pack light — understand, the hardest part. How can you pack light in winter? Do you see why Christmas is somewhat stressful, even if I love it, and all? But I had promised you a bûche de Noël, and I do not want to leave before sharing it with you. Not only that, but I also want to show you what happened last Thursday, chez nous ! Isn’t this field of snow something else? All white, all fresh, and …cold, I hear some of you say. Yes, it is cold, but so soft too! Oh, I love the snow, and my snow shoes. Do you know what is amazing? I thought that I had already seen it before — well sure, I obviously did somehow — and that it might not be worth taking my camera out when I left for a snow shoeing walk, because it would look just like the last time. But it is never like the previous time, and this is precisely what fascinates me about the bounty of nature. It always keeps something for you. In fact, every day, the scene is different. One cloud here, one beam of sun there, one bird on a branch, and you have a new landscape to admire. Do you see? When you think you could be bored, you have no reason to. But I am getting side-tracked. Let’s get back to the food, and the bûche, shall we? Perhaps you remember the bûche I made last year, with vanilla cream, and marinated kumquats? I was delighted to hear that my friend J. successfully made her first bûche last week, using this recipe. This year, I wanted to follow a different color pattern, and make a black and white bûche. I settled for chocolate with coconut, and used quinoa and brown rice flours for a gluten-free version of the cake. Then, since I could not picture P. and I eating a whole bûche between the two of us, I asked a bunch of friends to become my guinea pigs, and eat it with us. I sense that they pretty much loved the idea. At this time of year, walk in the streets of any French city, town or village, and you will be able to admire beautiful bûches displayed in the windows of pastry stores. Every bakery makes their own. When I was a kid, I was longing for Christmas day to come, just to discover and eat as many bûches de Noël as I could. They can be simple, like mine, or elegant and fancy, like many made by great pastry chefs, or talented home cooks. Traditional bûches use a génoise, a thin sponge cake that is rolled tight, so that it takes the shape, and looks like a wooden roll. They are filled with a flavored butter cream, like vanilla, chocolate, or chestnut, to only name of few common choices, and garnished with a thick coat of ganache or cream icingor powdered sugar. Some bûches will use a lighter flavored mousse instead of the butter cream; lemon or rhubarb remain my favorites. Since I did not have any rhubarb to use (unlike my mother who smartly freezes hers for the winter), I used coconut instead. P. loves coconut. And so do I now. But in fact, I am still debating what dessert I actually want to prepare for Christmas — my parents-in-law will not be upset that I tell you that I am glad to avoid plum pudding! Perhaps you have to be born Irish, or English, to understand plum pudding. I have many ideas, like my raspberry and gingered chocolate mousse cakes. I made six of them for a lovely dinner spent at home with friends, last night. I will pack my ring molds, and plastic liners, just in case. But then, snow eggs, Molten chocolate cakes, a white chocolate gelée with raspberries, a white chocolate mille-feuille, a fruit tiramisu, or a chocolate charlotte would make great choices too. But tell me about you! Inspire, inspire! 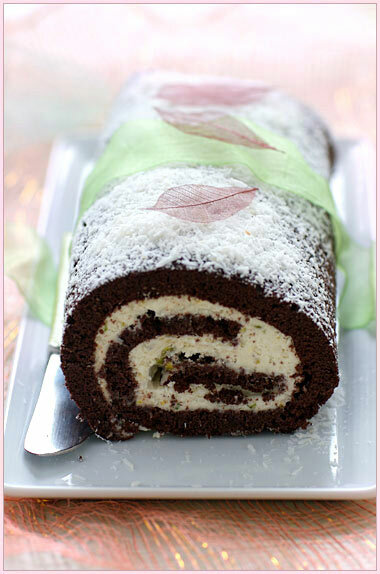 Have you already decided what desserts you wanted to prepare for Christmas? *Note: You can substitute quinoa and brown rice flours with all-purpose, or baking flour. ** Generally speaking, assume that 4 gelatin sheets equals 1 envelope powdered gelatin, although the strength in gelatin varies according to brand. A few tests may be required. Use whichever you feel more comfortable with. I am personally more comfortable with sheets, which can be found online in the United States. To prepare the sponge cake, preheat the oven at 400 F.
Place the egg yolks with the sugar in a bowl and beat until white in color. Then add the melted butter, and the sifted flours, cocoa powder and baking powder. Whip your egg whites firm with a pinch of salt. One min before they are ready, add 1 Tbsp sugar, and continue to beat for 1 min. Fold the white eggs in the previous preparation, adding 1 Tbsp first to make the dough more relaxed. Pour on a baking sheet (15″ x 10″ x 0.5″) covered with parchment paper, and cook for 10 min. Remove and flip the top part on a wet cloth. Carefully remove the parchment paper, and roll the sponge cake in the wet towel, to give it the shape of a “bûche”. Let cool. To prepare the cream, place the mascarpone in a bowl. Mix and add the grated coconut, coconut milk and sugar. Soak the gelatin sheet in a large volume of cold water for 5 min, then squeeze the water out. Heat 1 Tbsp coconut milk and add the gelatin to dissolve. Mix in the mascarpone cream, with the pistachios. Whip the cold heavy cream firm, until it forms peaks. Fold in the coconut-flavored mascarpone. When the cake is cooled, unroll and spread this cream on all the surface. Roll into shape again, removing the towel this time. Wrap in plastic film, and refrigerate for 12 hours minimum. When you are ready to serve, cut the two ends to show the pattern (you can nibble on these later), and sprinkle the bûche generously with confectioner’s sugar, and grated coconut. And enjoy ! 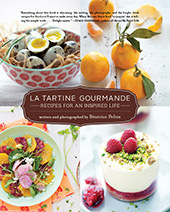 *Remarque : vous pouvez substituer les farines de quinoa et de riz complet par de la farine blanche T45. Pour préparer la génoise, préchauffez votre four à 200 C.
Séparez les blancs des jaunes d’oeuf. Dans un saladier, battez les jaunes avec le sucre jusqu’à blanchiment. Ajoutez le beurre fondu, les farines, le cacao et la levure. Battez vos blancs d’oeuf en neige ferme avec une pincée de sel, et 1 min avant la fin, ajoutez 1 càs de sucre pour les raffermir. Battez encore pendant 1 min. Incorporez-les délicatement à la préparation précédente ; ajoutez d’abord 1 càs de neige ferme pour détendre la masse. Versez cette pâte sur une plaque de cuisson rectangulaire (38 x 25,5 x 1,25 cm) recouverte de papier sulfurisé, et étalez-la uniformément. Cuisez au four pendant 10 min. Retournez la génoise sur un torchon humidifié. Enlevez doucement le papier sulfurisé, et roulez votre génoise pour la donner la forme d’une bûche, avec le torchon. Laissez refroidir. Pour préparer la crème, mettez la mascarpone dans une jatte. Mélangez bien avec la noix de coco râpée, le sucre et le lait de coco. Faites tremper la gélatine dans un grand volume d’eau froide pendant 5 min, puis essorez-la. Faites chauffer 1 càs de lait de coco et mettez-y la gélatine, pour la dissoudre. Ajoutez à la crème de mascarpone avec les pistaches. Battez la crème froide en chantilly et ajoutez-la délicatement, en faisant attention à ne pas faire tomber la masse. Une fois que le gâteau est refroidi, déroulez-le et étalez la crème dessus. Roulez à nouveau pour former une bûche (sans le torchon cette fois). Enveloppez dans un film plastique, et mettez au frigidaire pendant au moins 12 hours. Au moment de servir, coupez une tranche à chaque bout pour montrer le dessin (vous pourrez les grignoter plus tard), et saupoudrez la bûche généreusement de sucre glace et de noix de coco râpée. Dégustez et régalez-vous ! Pour les repas de Noël de cette année, les desserts seront: une poêlée de clémentines flambées à la liqueur Napoléon avec leur sorbet d’agrumes, le lendemain une charlotte poire/chocolat et des panacotta au gingembre avec leur compote de mangue. Le tout accompagné des biscuits de Noël déjà réalisés. Mais maintenant je voudrais trouver un repas où caser cette recette de buche. Ces photos sont toujours si appétissantes. Really beautiful photos not to mention the roll. Hello Bea! I’ve been reading about the snow back east- our son still lives in Massachusetts (we moved west a year and a half ago). Your photographs bring me right back to Boston. And your cake roll is a thing of beauty. Lovely! All the best to you- ! wow….snow! Makes me miss home (I grew up in Boston). The Bûche de Noël is lovely! Quelles magnifiques photos de neige! Cette bûche est parfaite! I was going to make a dessert roulade, with dark chocolate with morelle cherries, which seems close to what you have made here, except my recipe is free of all flours, being essentially a sheet of dense chocolate meringe rolled around a filling. A bûche de Noël, still, I think. However, seeing this, I may attempt your gluten-free flour version instead, but with an egg-replacer so that everyone in our family can enjoy it. I think that I would have to reassess my wet cherries and brandy, though, which are probably a bit heavy for a sponge. If I do get time to make this, I’ll certainly report back here. Thank you! Coconut and chocolate are great together. Béa the snow walk is fabulous! I know I’m bad but I think the world is always a fascinating place and the people in it. At least the people who aren’t bored. It seems to me if you’re bored, you most likely are not very interesting. I think since it’s going to be our first Christmas in our lives for just the two of us, we’ll be simple and have mother’s fruit cake. But, your snow eggs might make their way to our table. Congratulations! Your pictures are always stunning, so it’s no surprise that you won! For Christmas, I want to make mini tarts (but what flavor?!? 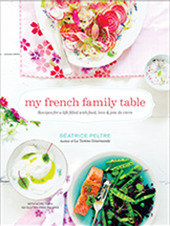 ), that can be made a few days ahead, and then I was thinking about poached pears for dessert! But I love your snow eggs — I definitely want to try those. And who could possibly resist a molten chocolate cake? Je ne me suis jamais risquée à la buche… pourquoi pas cette année… ta recette me tente bien. Merci pour la recette! Je vais l’essayer pour mon diner de Noel! Bonnes Fetes de fin d’annee! What a lovely yule log! Well done bea! Beautiful buche! Have a wonderful holiday visit with your family. What a beautiful buche! I wish I could roll mine that perfectly! Your first choc cake picture is soooooooo beautiful, it’s like the cover of a magazine/cookbook. You won! You won! Congratulations!!! When I think about our email exchange…it ‘s weird to say but it was like baking with a big sister.Just to think we were baking the same thing again!!! Je me la mangerai bien toute seule la buche a la noix de coco puisque B. n’aime pas ca…le fou!! Quelle belle balade, je t’envie. Bon voyage! Je repars rouler mes truffes,recette de grandmere! Strressant peut-etre, mais si beau, du moins chez toi. Bon voyage bea. et bien, ici, dans le Sud, nous pratiquons les treize desserts, tu sais. Les gens du Nord sont d’ailleurs bien déçus lorsqu’ils voient nos 13 desserts car ce sont des desserts de pauvres : les mendiants, le nougat blanc puor symboliser les jours gais et le noir, pour les jours tristes, la pompe, les calissons d’Aix, les dattes, des fruits frais mais surtout du raisin, du melon vert (normalement conservés dans les greniers depuis l’été en retirant à chaque fois les grains pourris pour éviter que toute la grappe ne pourrisse…mes arrière-grand-parents faisaient ça ! ), de la pâte de coing, des mandarines ou oranges, de la confiture, voilà, en fait ce que les gens avait de doux et de précieux dans leurs placards, tout ça nous remet un peu à notre juste place…. Bravo pour ces superbes images ! Petite question : quel est le plat servi lors de ce diner ? car la photo est alléchante ! Alexia, le plat principal est un filet de cabillaud cuit a la japonaise, avec gingembre, dans une sauce au vin blanc, soja, et une garniture d’oignons tiges blanchis, melange avec des cacahouetes hachees, gingembre. Le riz est un riz parfume au mirin/sake, entre-autres. Je publierai la recette une fois que j;en aurai le temps. Your photos are always so beautiful and inspiring. I have been in a frenzy of baking, cooking all sorts of different biscuits (cookies for US readers) for christmas gifts. I have the savoury menu all sorted out for Christmas night, but desserts… I am torn. I can’t decide between inventions… B52s (a butterscotch Schnapps sauce, with a Bailey’s Irish cream mousse on top with Grand-Marnier floated on top of that) or orange Grand-Marnier mousse served in chocolate tulips. Oh, que j’aime les buches de noel. Peut etre je l’en pourrais faire un cette anee. (I could just feel myself butchering that sentence and it hurts to have lost so much of my grammar . . . just painful . . . I think I really, really need to get back to France and practice :-)). Et bien voilà ! Je la tiens la seule et unique recette de roulé qui me séduit !!! Merci Béa, vraiment, merci. Great buche, great pictures, great website ! Hi! 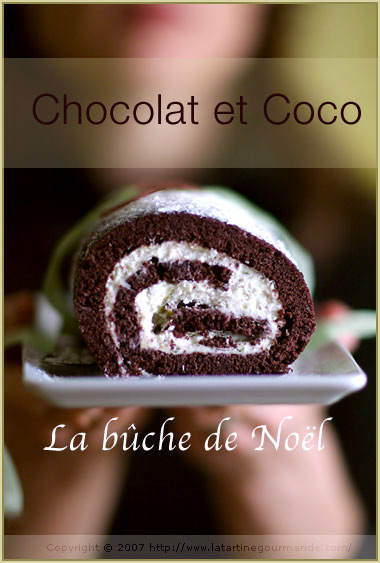 I’ve been looking to find a place to find good buche de noel but on the internet i found a lot of recipes. But in fact, I just want to buy a readymade one as i’m terrible at baking. Any guidance would be greatly appreciated. Thank you. I’m a high school student in a French class and was curious about making a buche de noel for my class. I was surprised to see a gluten-free cake! My older sister is a celiac, so i am ready to start making this! Thank you for the recipe! Délicieuse!! J’ai fourré la buche et l’ai recouverte de mousse au chocolat – merci pour la recette! First visit to your lovely site ……. I’m tired just reading about all that you doooo – LOL !! I’ve enjoyed reading and trust you will keep up all the good work. I’m sure you are a blessing to your friends. You help them make good memories for their golden years! You did inquire about what our Holiday desserts are …… well, I want to share with you all that I just watched my 6’3″, single-parent son go thru the throes of baking his first batch of Chocolate Chip Cookies with his two sons gazing into the bowls, whining for a chance to stir, blend, lick the beaters. and declare squatter’s rights to the prime property in front of the oven so that they could watch the cookies rise and brown. My, oh my, what a treasure for my golden years; what a lesson for my son; what a lesson for the boys ….. what a blessing to have been part of this in their lives. Now, it wasn’t Bûche de Noël, but it was divine and eternal and made me feel very Merry this Christmas. By the way, your site just might have given me the courage to venture into Bûche de Noël land for next Christmas. That would make a big, rewarding project with all the grand kids. God bless all of the families that read this comment …. may all wayward children make an about face and be home next Christmas. Thanks for such a lovely Blog.